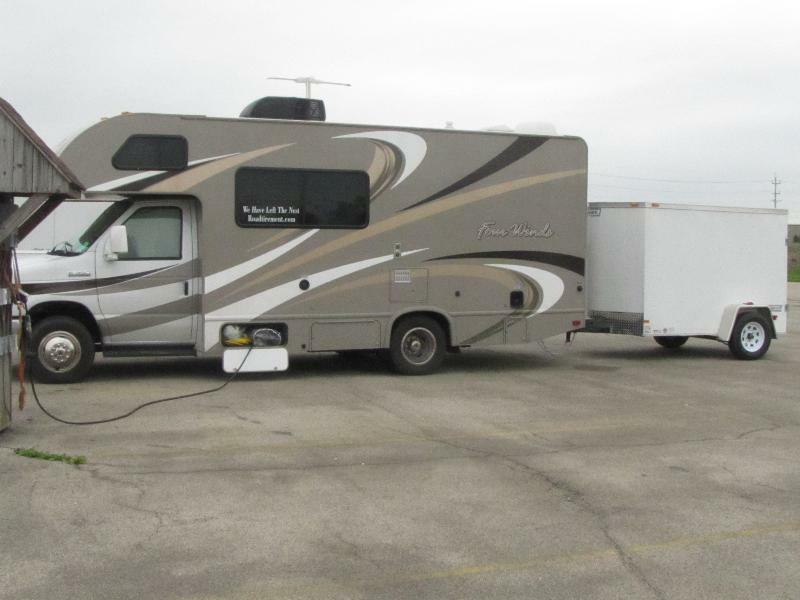 Sher and I bought our Thor Four Winds class C motorhome from Tom Raper RV in Richmond, Indiana in December of 2014. We got a great deal, were treated well and very satisfied with the transaction. Tom Raper has been in the RV business for decades and most in the Midwest recognize ads for Exit 149A on I-70 in Richmond. I was surprised when I went to the Tom Raper website in the search for a cargo trailer and bam! there was the Camping World website! The deal was reported back in January by media. Sadly media also reported that founder Tom Raper passed away this April in Florida. Tom Raper RV is now a Camping World dealer. We got another great deal on a cargo trailer, working with Mitch Crowe, our salesman from the Thor Four Winds deal. Once again Mitch took great care of us. Within a couple of hours we had purchased the trailer, had it correctly hitched to our motorhome and were on our way. We went to Michigan to get some merchandise to sell at upcoming festivals and shows. The pesky April weather was chilly, and our furnace in the Thor would not work. Heading back south we detoured to the Tom Raper/CW dealership. Long story short, the service department with no hassel found the problem (a bad contact in the thermostat) and even took care of a couple of other minor issues. Hats off to technician Steve and Hank and Paul at the service desk. I have talked to several Tom Raper employees from the sales, parts and service departments. All said they were pleased with the transition from Tom Raper to Camping World. This change sems to be a good thing for not only the staff but also the customers of this dealership. I was very pleased with the way they took care of our furnace issue and the help with the other minor issues.